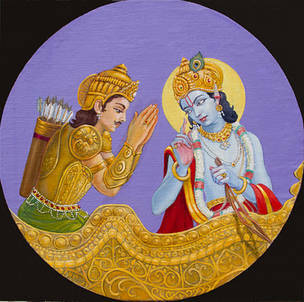 Sri Krsna said, “My dear Parantapa Arjuna! Both you and I have passed through many births. Being the Supreme Lord, I remember all of them. You are a minutely conscious jiva, hence you don’t remember any of them. Whenever I descend to the world, My perfected devotees also appear with Me to nourish My pastimes. But I am the only all-knowing Purusa who is cognizant of everything. Although all of you and I come to this world again and again, there is a categorical difference between My appearance and yours. I am the Master of all creation, beyond birth and imperishable by nature. With the help of My internal potency, I appear in this world. But the jivas are controlled by My maya-sakti to take birth in this world. In this way they cannot remember their previous births. As a result of their karma, taking shelter of their subtle body (linga-sarira), they attain another birth. It is not that I appear only in the land of Bharata. Depending on the necessity, I appear in all places inhibited by demigods or demons due My own will. So do not think that I never appear in the land of Mlecchas and other lower races. Depending on the extent and depth to which those men have accepted true dharma as their own religion, then that much degradation is also rectified and I safeguard dharma as a saktyavesa-avatara. But in the land of Bharata, since varnasrama-dharma is effectively practiced there as one’s prescribed duty (sva-dharma), I consider the countrymen of this land as My subjects and I am more concerned in mercifully establishing dharma there. Therefore you will observe all the most charming avataras such as the yugavataras, amsa-avatara etc. within the land of Bharata. Where there is no varnasrama-dharma there is no proper execution of niskama-karma-yoga or the perfection of jnana-yoga or the ultimate achievement of bhakti-yoga. But if it is observed amongst the lower classes (outside the varnasrama system) that there is a significant advancement in bhakti, it should be understood that it is the result of a devotee’s mercy that there is a sudden connection established. Within the saintly kings and others who are My devotees, I give them the empowerment in order to establish varnasrama-dharma. But for those sadhus who are great devotees, to save them from non-devotees, it becomes essential for Me to descend. Thus, by becoming the yugavatara I protect the sadhus, isolate the non-devotees and establish them in the religions meant for annihilation (nasya-dharma), and by preaching the devotional processes of hearing and chanting, I establish the jiva’s eternal constitutional position. It is said that I descend in every age – from this you can accept that I also descend in the age of Kali. The avatara for the age of Kali will establish the most rare prema only with the help of the paraphernalia used in kirtana. Since He has no other purpose, in spite of this avatara being the best of all avataras, He is hidden from the common people in general. 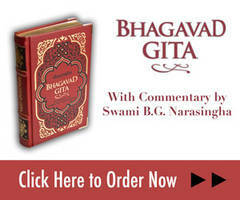 My greatest devotees will naturally be especially attracted by that avatara. You will also be able to observe this by descending as His associate. This avatara, who is the deliverer from the age of Kali, will only annihilate the evil-propensity. Apart from that there is no killing of demons as in other ages. This is the supreme secret regarding this hidden avatara.